Melanie, Gemma and Paul are helping Des pack up his house. Melanie is also sorted with a flat. Joe staggers in with a television for Melanie that looks like it was found at the dump! Nevertheless, she is pleased. 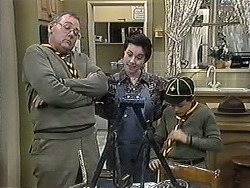 Harold and Toby are putting on their Scout uniforms. Toby and Kerry show Harold Joe's "abstract art". He says it has a remarkable resemblance to a pile of junk! When Harold and Toby have gone, Matt comes in. He tells Kerry that he's having trouble finding housing - he might move back in with the Robinsons. 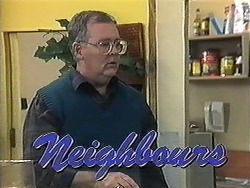 He's not sure though - Jim and Beverly might need some space after recent events. Kerry invites Matt to move in with them instead, until the baby comes. He's a bit takenaback but thanks Kerry profusely. She says they can use the extra money and Joe will be fine about it. Beverly comes in looking upset. HELEN: Beverly, where have you been? HELEN: What is it? Is everything alright with the baby? BEVERLY: I don't want to talk about it until Jim comes home. HELEN: Is there anything I can do? But Beverly goes into her bedroom and closes the door behind her. Ryan is putting manure on the garden when a girl (Annabelle) drives up. He offers to meet her later and she suggests going to the cinema later. Joe comes over and drags him back to work. 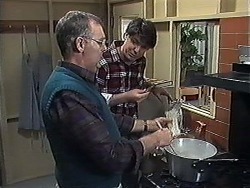 Jim comes in and Helen tells him that something bad is going on with Beverly. HELEN: I think something's terribly wrong. Just then, Beverly comes out of her bedroom. JIM:(gently) Hello, darling. It's alright. HELEN: Fetal demise, miscarriage, it all amounts to the same thing - the baby is dead. 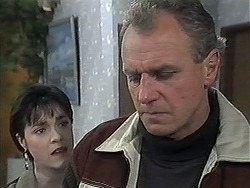 Clarrie sympathises and says that Beverly must be devastated. Helen has decided to give Jim and Beverly some space. She wonders what this is going to do to Jim and Beverly. Beverly has been through so much - she's already had a miscarriage, and then lost Rhys, and now this...how will she cope? It could be the last straw for Jim and Beverly's marriage. Clarrie tells her not to jump the gun. He tells Helen that he'll always be there for her, any time she needs him. BEVERLY: Jim, there is no explanation for why our baby died. These things happen. I have to believe it was nature's way of saying there was something wrong. JIM:(after a pause) So...what's the next step? BEVERLY: I go to the hospital tomorrow and they'll...induce the baby. BEVERLY: I don't know how I'm going to handle this! JIM: I know. I do know. BEVERLY: I was hoping that this baby would bring us back together. JIM: Darling, we *are* together. BEVERLY: No! I mean, together! Annabelle is still hanging around while Ryan lays turf. She suggests she could get him some cleaner work through one of her father's friends, but he tells her to wait in the car. Ryan asks Joe to pay him earlier, but Joe points out that *he* hasn't been paid yet. Matt and Christina comes over to see how Melanie and Gemma are doing. Des and Paul are there too and Matt tells them that he's moving in with Joe and Kerry. Melanie is looking for Trevor the kitten who has vanished. Joe is working on his abstract art masterpiece while Toby plays with the kitten. Kerry says she'll try to sell the kitten on the weekend and maybe Joe could sell his sculpture too. JOE: Get real, Kerry! They're not going to be able to afford something like this, these refugees from the sixties, this is art! KERRY: Oh, I'm sorry, I didn't realise, of course! JOE: Yes, I'll talk to Helen about how much I can get to flog it. KERRY: I don't care what you do with it, as long as you keep it off the table! Kerry breaks the news that Matt is moving in and Joe doesn't look too pleased - he says he likes their privacy. JOE: What if I want to walk around in the nuddie? 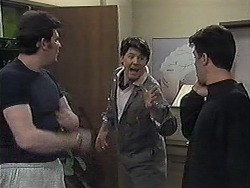 KERRY: Joe, you don't walk around in the nuddie! JOE: Oh, no, not now...but when I'm an artist, I might want to! Joe doesn't really mind about Matt moving in though - he's young and single so won't be around much anyway. Clarrie invites Helen to stay for dinner and she agrees. Ryan and Annabelle are off to the cinema, but not before Ryan asks Clarrie to send him some money. Melanie is still looking for Trevor the kitten, but he is nowhere to be found. Finally they hear some mewing and Trevor is found inside the television! Luckily, he is unhurt. Des suggests they get takeaway. Gemma agrees to stay and Matt looks pleased. Jim is crying on the sofa when Helen comes in. She rants at Jim for leaving Beverly on her own at the hospital. He tells her he couldn't handle it, seeing Beverly in the hospital bed he could see Ann on the night she died. He says he'll go back when he's got himself together, but Helen says Beverly doesn't want to see him - she's very angry with him for leaving her. 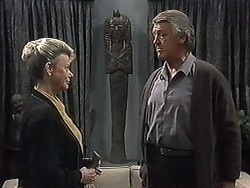 Harold tells Joe that he's seen his sculpture. Joe says he's been down at the library looking at sculpture books and he reckons he's the next big thing. Kerry is sympathising with Jim about the baby. She offers to go down the hospital, but Beverly doesn't want visitors at the moment. 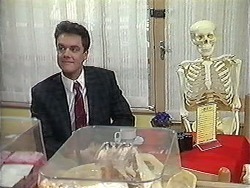 Joe has brought a skeleton into the Coffee Shop and is larking around with it, scaring Melanie, who runs off screaming!